UNLOCKING THE TRUTH — the heavy metal band from Flatbush, Brooklyn made up of three African-American boys, guitarist/vocalist Malcolm Brickhouse, bassist Alec Atkins and drummer Jarad Dawkins — will release its full-length debut album, "Chaos", on June 17 via premier independent music distributor Tunecore. The set was produced by Johnny K (MEGADETH, POP EVIL, DISTURBED) and captures the young band's explosive live energy, resulting in a tight, powerfully heavy yet melodic full-length offering. Of "Chaos", Brickhouse commented: "We can't wait for everyone to hear our album. We've worked very hard to give the fans something they'll love and never forget. We hope they are able to relate to the songs the way that we do and have the time of their lives listening to them. We know that this album will blow you guys away." UNLOCKING THE TRUTH last year spoke to The Daily Beast about their decision to sever ties with Sony, less than a year after signing with the major label. "It was pretty difficult at times with [our] meetings [with Sony] — especially with this one particular lady at the label, who had a meeting with us once where she was just talking at us for six hours," Alec said. "We were pretty young at the time so we were pretty restless and wanted to get up and do something else, but she just had us in this meeting for six hours." As part of its guaranteed two-album deal with Sony, UNLOCKING THE TRUTH was reportedly due to receive $60,000 to record the first disc and possibly as much as $325,000 for the second CD. Sony reportedly had an option to release a total of five albums from UNLOCKING THE TRUTH that could have pushed the label's financial investment to around $1.8 million ($325,000 for the second album, $400,000 for the third, $450,000 for the fourth and $550,000 for the fifth). It should be noted, however, that the band was only supposed to see the real money after an initial $60,000 advance if their debut album sold more than 250,000 copies, a prospect that seemed highly unlikely in an age of diminishing record sales. Luke Meyer, the director of "Breaking A Monster", a documentary about the band's rise to success, told The Daily Beast: "The $1.8 million is what happens if you add up all their advances for five records, and it increases in amount with each successive album. "That's what everyone says about the music industry — it's got all this glitter on it, but it's always less flashy than it looks." The members of UNLOCKING THE TRUTH famously got permission from a New York judge in July 2014 to sign the Sony deal. The musicians needed the judge's approval because they were minors. UNLOCKING THE TRUTH has already played the Coachella festival and has supported GUNS N' ROSES. In addition, the band has appeared in a national ad campaign for Verizon Wireless. 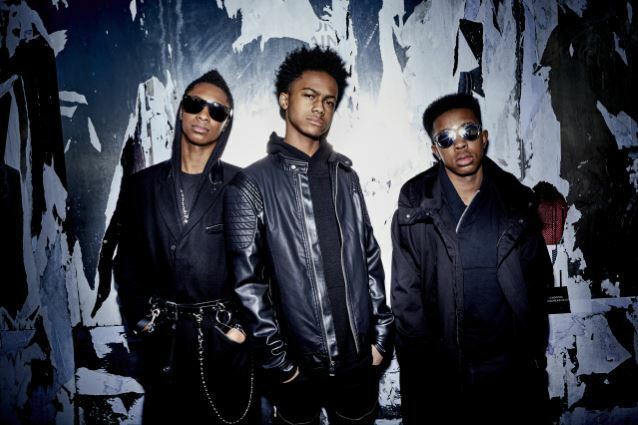 UNLOCKING THE TRUTH credits bands such as METALLICA, SLIPKNOT, DISTURBED, CHELSEA GRIN, MOTIONLESS IN WHITE and ESCAPE THE FATE as its influences.